Group projects will engage external partners to provide a knowledge synthesis, from a variety of disciplinary perspectives. Advanced students in the program will work with selected clients over six months to produce substantive and relevant work products, overseen by faculty at UCD. 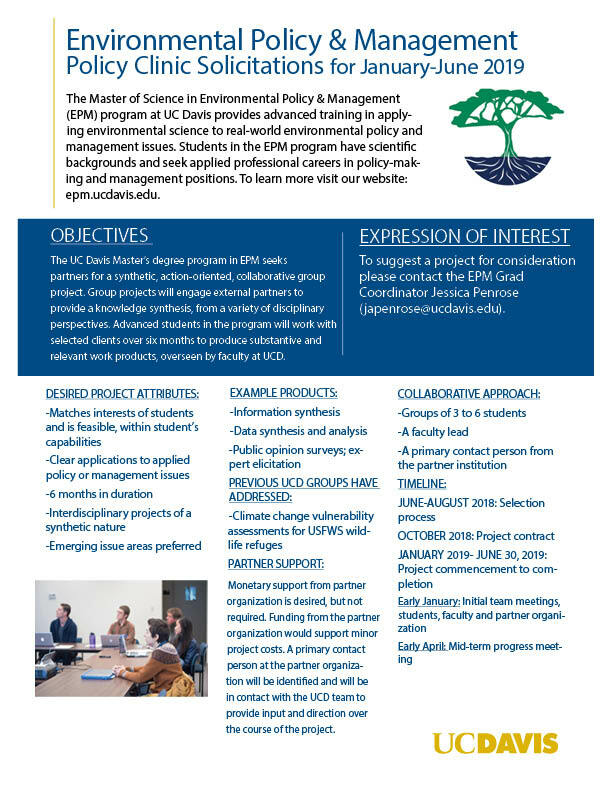 The EPM program has developed the Policy Clinic as an integral part of the curriculum to give students hands-on training and experience at solving real-world environmental problems. This helps prepare our students to develop the essential skills to solve multifaceted, multidisciplinary environmental issues before they enter the workforce. The Policy Clinic also gives the opportunity for external partners to build a working relationship with the EPM program. Interested in suggesting a project for consideration? For further details, please see our Policy Clinic flyer. All EPM students complete an internship as part of the master's program, either over the summer or part-time during the academic year. Interested in sharing an internship opportunity with our students? Please contact Grad Coordinator, Jessica Penrose.